Pasta and pizza is all well and good on a trip to Italy, but sometimes you just fancy a change… and if you do, Dar Filettaro is the right place to go. A hole-in-the-wall kinda place just off Campo dei Fiori, it’s usually full of locals – the speciality here is fried baccala, a type of salted cod, which they serve in paper to eat in or take away. Fried baccala is a very traditional street food in Rome, but it doesn’t mean it can be found everywhere! 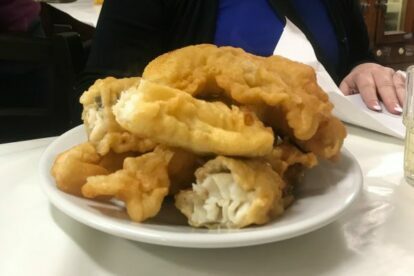 The fish is originally dried, but after putting it in water to extract the salt and frying it in a light batter, you’d never even know – it’s light and pillowy and makes for a great snack as you wander round the city, or a meal if you want to eat in. If you choose to eat in, there are a few other items on the menu to accompany the fish – I’d recommend the puntarelle, a very Roman choice, which is a salad made from chicory and a dressing of anchovies, garlic, vinegar and olive oil. The house white wine, available by the litre, accompanies it well!